We've loved exploring books by Lois Ehlert this month as part of the Virtual Book Club for Kids. The Virtual Book Club for Kids is hosted by Toddler Approved (me! 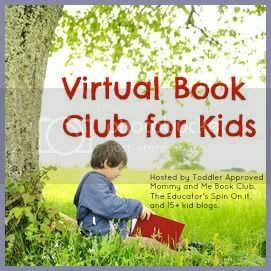 ), Mommy and Me Book Club, The Educators' Spin On It, and 20+ kid bloggers. Each month this year we will spotlight a new author and create book related crafts and activities to go along with the books we choose. 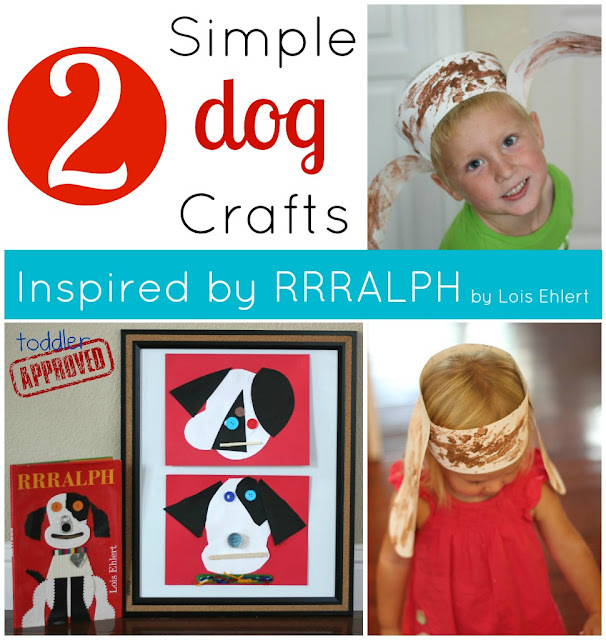 We had a hard time deciding which Lois Ehlert book to spotlight this month, so we'll be sharing crafts and activities inspired by RRRALPH today and Top Cat tomorrow. My daughter is obsessed with dogs and cats, which is why these two books were hits with her. 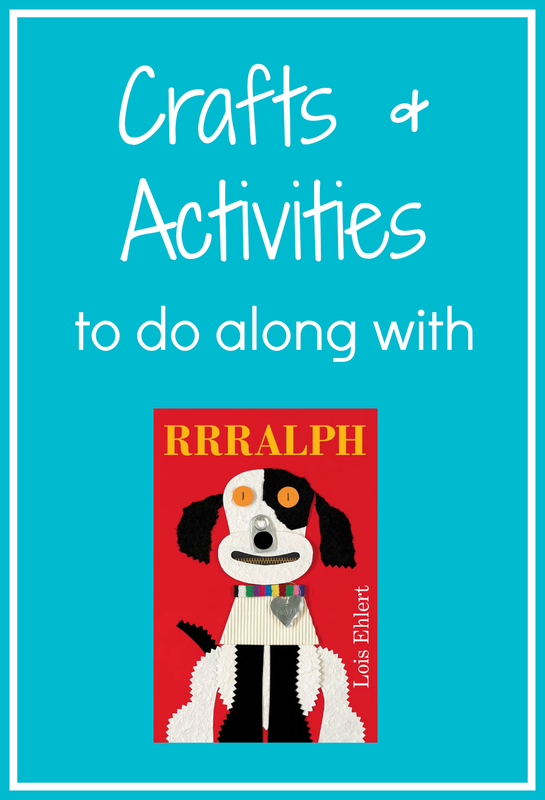 RRRALPH is a silly book about a dog that can talk! The three dimensional collaged illustrations are probably my favorite part of the book, along with the comical way that Rrralph answers the questions he is asked with dog answers. Materials Needed: white cardstock, paint, sponges, scissors, and a stapler. I did this craft with my 21 month old daughter. She loved it! It was simple, open ended, and allowed her a lot of freedom to have fun exploring with paint! Cut out to two ears and two strips of paper for the hat (adult-prep ahead). 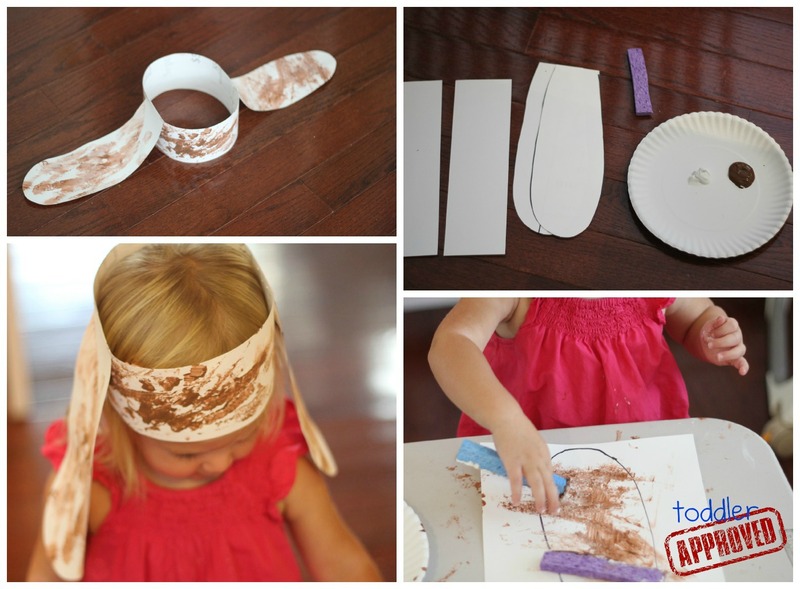 Start painting the ears and strips using a sponge and paint. Staple strips together to make a hat (adult). Staple ears onto the hat to make it look like a dog (adult). Once we had our hats on, it was time to create our own RRALPH collage art! Materials Needed: colored cardstock (we used red, black, and white), Elmer's glue, buttons, scissors, pencil/pen, realia from around the house to add details to RRRALPH. The art featured in RRRALPH is collage art. It is created with realia (real objects) and painted and textured papers. It is also three dimensional art! We decided to create our own dog pictures using materials we found around our house. This art project was designed as a scissors skills practice project for my son (who needs some help with cutting)... and he loved it! We used popsicle sticks, yarn, buttons, craft sticks, pennies, and bottle tops for this activity. Feel free to use whatever your child thinks will be cool! Draw the different shapes needed to make RRRALPH onto cardstock (adult- prep ahead). I drew two ovals, triangle ears, and an odd shaped piece for his eye. Have your child cut out the shapes (or have them pre-cut for younger kids). Glue shapes onto a different colored cardstock. My 4-year-old son very carefully worked to make his dog look similar to the one on the cover of the book. My almost 2-year-old daughter was very distracted by the glue and interested touching it a lot. She enjoyed laying her shapes in a clump. Go on a hunt around your house to find objects to use for RRRalph's nose, mouth, and eyes. We also looked for materials to use for his collar. Add any extra details (my son made a dog collar with yarn strips and a popsicle stick). Hang and admire... or you could ask your collaged dog some of your own questions and see if he answers you? I love how different my son and daughter's pictures turned out... yet they are both gorgeous! It took a lot of restraint for me to not try and "fix" my daughter's dog picture and make it look more like a dog. 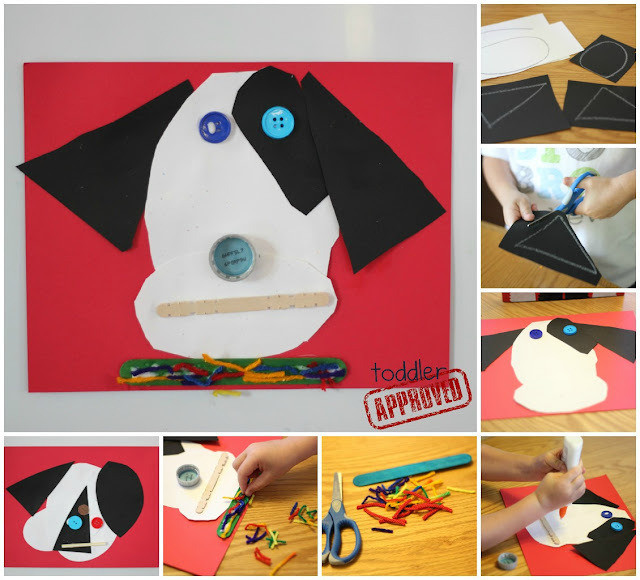 This activity was all about process art and exploring and finding materials to use in the collage... NOT about making the perfect dog picture. Now that we've shared our crafts and activities with you, we're excited to see what you came up with! Please add your links to any Lois Ehlert inspired posts to the blog hop linky below. Link up only posts inspired by Lois Ehlert that share children's book inspired crafts, activities, recipes, etc. Any other posts will be deleted. I love the dog-ear headband!!!!! My boys are constantly pretend dogs - I might adapt your headband idea with some brown felt to make them more durable and add to the dress-up bin! Thanks for hosting! Your ears are so very cute! Love the sponge painting! I love the puppy hats! My three year old will really enjoy doing this. I need to make a library run. I also love seeing the different end results on the puppy craft. I agree with your process over product approach- but I also find myself fighting the urge to make little corrections! What cute crafts! I love the dog ears!